Mahabharat is full of love stories. It was not only about battle between good and evil. Mahabharat was lot more than this. We find examples of revenges as well. But you might get surprised seeing the incidents of love. Yes, you heard me right. There are numerous incidents of love as in the great epic of Mahabharat . Read on. Ganga and Shantanu – King Shantanu was the emperor of Hastinapur, a descendent of King Bharat. He was a powerful monarch and ruled his people with truth, justice and love. In his realm none were sick or poor or without food. All were employed. One day, Shantanu was riding his chariot along the banks of the Ganga river when he chanced to see a stunningly beautiful maiden sitting on the riverbank. She was dressed in white silk robes and had lustrous black hair and creamy skin. Her eyes were dark and liquid and fathomless. He was fallen in love with her immediately and proposed for an union. Ganga accepted on one condition and that condition proved to be a heart wrenching one for Shantanu. Bhishma Pitamah was born out of this wedlock. Shri Krishna and his 16,108 wives Out of 16,108 16000 waited not many years but they reincarnated to get married to Shri Krishna. The Supreme Lord can make everyone happy because he is the only one with the power to love everyone in the way they want to be loved. Others may tell us that they love us but we never really believe them. But Krishna, who we cannot see with our material eyes, loves us and we know it, even if he never tells us. That’s the power of the love of Krishna. Draupadi and Pandavas Draupadi got married to all five Pandava brothers. She had to maintain commitment towards each of her husband. Not only that, all brothers had to trust Draupadi to do the justice. All six of them went through the adversity of life like living in exile. But, Draupadi always trusted them. 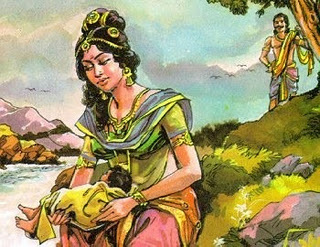 Gandhari and Dhritarashtra – After Vichitravirya’s death, his mother Satyavati sent for her first born, Ved Vyasa. According to his mother’s wishes, he visited both the wives of Vichitravirya to grant them a son with his yogic powers. When Vyasa visited Ambika (Sister of Amba), she saw his dreadful and forbidding appearance with burning eyes. Frightened, she kept her eyes closed. Hence, Dhritarashtra, her son, was born blind. Ved Vyasa was the person, who wrote Mahabharat. The love story of Gandhari and Dhritarashtra started after their marriage. Gandhari, on meeting him and realizing that he was blind, decided to deny herself the pleasure of sight that her husband could never relish. She blindfolded herself voluntarily for her whole married life. Arjuna and Uloopi – Uloopi was Naga princess and she abducted Arjuna when she fell in love with him. She later convinced him for an alliance as the rules of celibacy applied to him with a relationship with Draupadi and not with other women. She later gave him a boon that he cannot be harmed in water. Note: Arjuna was on an exile of one year during when this happened. Rukmani and Shri Krishna : Shri Krishna, the reincarnation of Lord Vishnu, abducted Rukmani to marry her against the will of her family. Although she was in love with Shri Krishna. Arjuna and Chitrangada – Chitrangada was the princess of Manipur. It was on the banks of the river Kaveri that Arjuna visited the kingdom of Manipur, whose king was Chitravahana. He had a very beautiful daughter named Chitrangada, with whom Arjuna fell immediately in love. When Arjuna asked for her hand, her father put forth a condition that their child must be brought up in Manipur and should succeed the throne. Arjuna agreed. After their son Babruvahana was born, Arjuna went back to join his brothers at Indraprastha, leaving behind his wife and son. After the death of Chitravahana, Babruvahana became the ruler of Manipur. Later, after the Mahabharat war, Arjuna was defeated by his son, Babruvahana. Arjuna and Subhadra – Arjuna and Subhadra’s brother Gada, have taken training together under Drona. During his exile of one year, when Arjuna reached Dwarka, he was invited at Subhadra’s place and both have fallen in love with each other. Arjuna married Subhadra, half sister of Shri Krishna. Shri Krishna has advised Arjuna to abduct Subhadra, and this was an acceptable behaviour of a Kshatriya. Even Shri Krishna did the same with Rukmani. Though Balram was not happy with this, Shri Krishna persuaded him to accept this alliance. When Subhadra reached Draupadi, she did not disclose the alliance with her. After an hour or so, when Draupadi was comfortable and happy with her, she told her about the marriage and Draupadi accepted her. changed every thing for her. After marriage they lived together only for limited period of time, then Bheema left as he have to. Hidimba gave birth to the Great Ghatotkacha and takes care of him alone without regretting anything. Later, Ghatotkacha played an important role in Mahabharat war, as Karna had to use the weapon Ekaghni to kill him, thus saving the life of Arjuna. No one on shore could see what they were doing. So, Parashar created an artificial mist around them. Her virginity would remain intact. Parashar assured that after she gave birth she would become a virgin again. She wanted the fishy smell that came from her body to be replaced by an intoxicating fragrance. Parashara said that a divine aroma would emanate out of her, which could be sensed for a distance of nine miles. She gave birth to Ved Vyas, the author of Mahabharat. Satyavati and Shantanu – The fragrance of Satyavati attracted Shantanu to her. He followed it to its source and found Satyavati sitting in her boat. 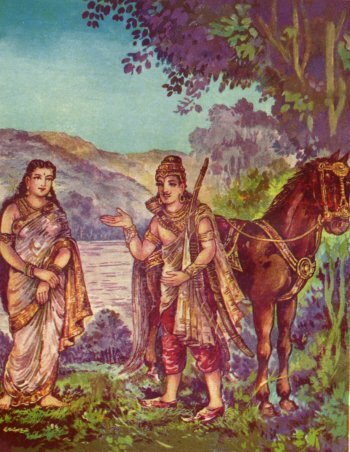 He stepped in and asked Satyavati to row him across the river. When he reached the other bank he asked her to ferry him back. This continued till dusk that day and continued daily for quite some time. Finally Shantanu asked Satyavati to marry him. Satyavati said that she was willing, but would be bound by her father Dashraj’s decision. It turned out that her father has ambitious plans for her and Shantanu was not able to satisfy them. The son of Ganga and Shantanu, made things easier for him and took some vows because of them he was called as Bhsihma. Nice collection of love stories from Mahabharat. Really liked them! Neatly compiled stories from Mahabharat. Beautiful article – Never thought that this could be an aspect from Mahabharat, an interesting one! thanks I wanted this story and i got it. can u please post story of karna n vrushali? awesome work done but can u please post karna n vrushali's story? I m not getting it from anywhere. genetical deshaped and disorded to lusty and bad brains and bad minds . some thing would have been wrong ) . insult was conspirancies or any ones evil idea . for enemities and revenges . childrens were given births by the other not by their husbands .